Background: Suit therapy is widely used to improve functions in children with cerebral palsy. Although the efficacy of suit therapy has been verified in previous studies, studies on the effects of TheraTogs are still inefficient. The purpose of this study was to compare the spatiotemporal gait parameters of children with spastic cerebral palsy wearing the TheraTogs suit. Methods: A total of 10 children with spastic cerebral palsy participated, and the GAITRite was used to analyze and compare the spatio-temporal gait parameters (gait velocity, cadence, step length, stride length, single support time, and double support time) of children with cerebral palsy while wearing and not wearing the TheraTogs. Results: There was a significant difference in the gait velocity, cadence, step length, stride length, single support time, and double support time between conditions with- and without the TheraTogs (p<0.05). Conclusion: The results of this study show that the use of TheraTogs in children with cerebral palsy may have positive effect to improve the gait ability. Cerebral palsy is a non-progressive disease that occurs in the brain of the developing fetus and infants causing limitations in activity and permanent disability. It also involves cognition, language, behavior, sensory, and musculoskeletal system problems . Decreased muscle tone, especially in the trunk, causes problems with stability and mobility. The spasticity in the lower extremities affects mobility and delays motor development, which is essential for independent gait . If gait ability does not improve through proper intervention, it may interfere with activities of daily living and can cause problems, such as instability, difficulty moving for a long time, and excessive energy consumption [3,4]. Normal gait requires coordinated and selective movement control according to muscle coordination and reciprocal control . Many factors such as age, muscle strength, and motor control should be applied normally . However, most children with cerebral palsy have abnormal muscle tone, reflex, and central control mechanism, and muscle weakness, impaired sensory exercise information, and ataxia . Suit therapy is widely used for children with cerebral palsy , It is a therapeutic approach for abnormal tone control and improvement of postural stability and function. Also, it uses the orthotic garment, which has been reported to improve postural stabilization, gait ability, and ability to perform tasks [9-11]. Recently, orthotic garments are being sold in a variety of forms; they are widely used at home because they can be worn for a long time during suit therapy [8,12]. Suit therapy promotes the proprioceptive sense of the child with cerebral palsy and improves abnormal muscle tone, posture alignment, balance, and gait . Typical suit therapies include AdeliSuit and TheraSuit . AdeliSuit was developed for Russian astronauts to maintain muscle strength during weightlessness. In recent years, it has been used for cerebral palsy with abnormal postural alignment to promote the proprioceptive sense and improve abnormal muscle tone, posture alignment, balance, and gait . In addition, the TheraTogs is a stretchy strap with a velcro on the vest; it improves posture alignment, joint stability, and exercise efficiency . Moreover, Richards et al. reported that TheraTogs was effective in the treatment of in-toeing gait in patients with spina bifida . Although the efficacy of suit therapy has been verified in previous studies, most of them are related to AdeliSuit [16,17]. However, studies on the effects of TheraTogs are still inefficient. Therefore, the aim of this study was to investigate the effects of TheraTogs on gait ability of children with spastic cerebral palsy and to examine its potential as a therapeutic approach in cerebral palsy. The desktop virtual environments we developed for the experiments reported here aim to emulate a stationary work area, where the avatar puppets the motions of the user’s arm in the real world, to allow the user to manipulate objects through the avatar’s actions. A typical example we have implemented is a kitchen food preparation area, where the user has control of one arm of the avatar in the virtual space to manipulate knives, bowls, food and other objects. The user can have full control of the arm(s), and in more immersive versions can also control head gaze and direction. We use the hands-free capability of the Kinect to test different conditions of physical embodiment in a vegetable cutting task, where the user has a (prop) knife versus a wand or a tracked empty hand when controlling an avatar with a virtual knife in the virtual environment. The Kinect device provides position information of the user’s hand in real space, which is transmitted to the running Blender program as a set of three position coordinates. We have developed the framework to gather this positioning information reported by the Kinect, and then transmit them to a running Blender simulation. We recorded the effector position in pixels every 10 ms.
3) Who can walk more than 10 meters independently without walking aids? 4) Who understand and can follow the instructions of researchers? 6) Do not have musculoskeletal injuries or problems including congenital structural deformities. A total of 10 subjects were screened, and general characteristics are described in Table 1. For all participants, children under the age of 18 had voluntarily agreed with the caregiver after full explanation of the purpose and procedure of the study. This study was approved by the Kyungnam University Institutional Review Board. After investigating the general characteristics of the participants, this experiment was conducted. The participants were allowed to walk on a gait mat while wearing and not wearing the TheraTogs. TheraTogs, which is worn by the participants, is used as a garment system to promote the children's functional recovery and postural correction. 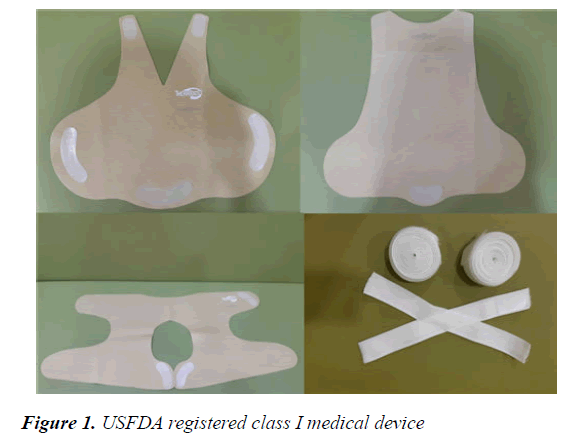 It is a US FDA registered Class I medical device. It consists of a garment (top and bottom) and strapping that is applied on the body of the target child  (Figure 1). Based on biomechanics, it has been reported to help children maintain the correct posture and provide appropriate sensory and vital feedbacks . The garment itself is elastic, and it wraps the child's body providing adequate compression and adhesion to help promote body movement and sensation. Strapping is added to maintain the child's alignment to stimulate the muscles that it holds and stabilizes . The gait mat for gait analysis was used. It evaluates the gait velocity, cadence, step length, stride length, single support time, and double support time, which are spatio-temporal variables of gait . The measurement was carried out by letting the participant stand in front of the gait mat and walk with a comfortable walking velocity by the verbal signal of the research assistant. Walking was repeated 3 times for each condition, and 3 minutes of rest time was provided between each measurement. When switching to other conditions, a 20- minute break was provided considering the time to wear the TheraTogs. GAITRite (The GAITRite Electronic Walkway, CIR system Inc, USA) is a gait analysis system that has an effective measurement area with a width of 61 cm and a length of 366 cm, in which sensors are arranged in a grid shape at an interval of 1.27 cm. A gait mat is spread flat on the floor, and the participant walks on the gait mat. A sensor responds to the foot pressure, and the information is saved on a computer through a serial interface cable to collect the information on the spatio-temporal variables of gaits. The tool’s test-retest validity is an intraclass correlation coefficient of 0.91, indicating high reliability . Statistical analyses were performed using SPSS version 18.0 (IBM Corporation, NY, USA). To analysis the demographic characteristics of the participants, a descriptive statistical analysis was conducted. A paired t-test was used for comparison condition with- and condition without the TheraTogs. All statistical significance levels (ɑ) were set at <0.05. Table 2 demonstrates the gait velocity, cadence, step length, stride length, single support time, and double support time between the conditions with TheraTogs and without TheraTogs. There was a significant difference in the gait velocity, cadence, step length, stride length, single support time, and double support time between conditions with- and without the TheraTogs (p<0.05). Table 2. Comparison of gait variables between conditions with and without the TheraTogs. The purpose of this study was to investigate the effects of the TheraTogs on gait ability in children with diplegic cerebral palsy; comparison the difference between the spatio-temporal gait variables was analyzed and compared between conditions with- and without the TheraTogs. The results showed that the spatio-temporal gait variables, including the gait velocity, cadence, step length, stride length, single support time, and double support time of the children with cerebral palsy wearing the TheraTogs were significantly improved compare to those who did not wear the TheraTogs. Previous studies reported that various forms of suits therapy can be effective for children with cerebral palsy who have a developmental disorder and lack of trunk stability and have an abnormal gait [17,21]. Romeo et al. investigated an effects of suit therapy on motor function and static balance in cerebral palsy. As a result of the study, it was reported that improved the static balance by providing better stability to the trunk due to the elastic properties of Suit . Elshafey  reported that posterior correction suit therapy for children with spastic diplegia may be effective in improving walking; the elastic strapping system of the postural correction suit plays a role in bringing the body alignment of participants closer to normal. The appropriate function of the restoration of posture and postural muscles is that it enables the patients to learn proper movement patterns. This effect improves the erroneous gait pattern and improves other executive mobility activities . Ko  reported that significant changes in step length and stride length after wearing a suit seemed to play a role in providing balance and stability during walking, this change is due to the postural correction suit providing external stability to the body, and reported that both legs provided adequate stability and mobility. In addition, Mahani et al. suggest that suit therapy may play a role in supporting weakened lower extremity muscles and stretching shortened muscles . Thus, it can be helpful by improving the stability and mobility of the lower extremity during gait . Suit therapy can be used not only for walking but also as a therapeutic approach for many purposes. The therapist can correct the abnormal movement pattern and it can be used to promote normal movement patterns in children with cerebral palsy by providing posture correction in real time through the suit without manual contact . This can be useful in situations when the therapist attempts to the manual correction the head or neck alignment by hand for children with developmental disabilities and when the upper and lower extremities show an abnormal movement pattern. In the present study, it was also found that participants wearing a TheraTogs had positive effect on gait variables without guiding the gait. In addition, Bailes et al. reported that AdeliSuit of children with cerebral palsy improved the gross motor function ; Bar-Haim et al. reported improved energy metabolic efficiency during stair climbing . A previous study reported that wearing TheraTogs alone, without a walking aid such as a cane, significantly activated the hip adductor, which plays an important role in gait . It is reported that suit therapy can provide intense exercise and resistance to children with cerebral palsy with low resistance to gravity and perceptual ability . Intensive rehabilitation program after AdeliSuit was able to elicit significant motor function improvements in these children . However, this study has several limitations. First, it is difficult to generalize the results of the present study to all other children with cerebral palsy, since only 10 children were included. Second, it is difficult to clarify the cause-effect of the TheraTogs within the limit of the cross-sectional study. In addition, the long-term effect was not be investigated. Finally, the fact that the developmental characteristics of the participants were not considered may prove to be a limitation. However, TheraTogs are made up of velcro, which are easy to wear by a protector and have several advantages, including the fact that they are relatively inexpensive in contrast to other suits. Therefore, based on the present study, high-quality clinical studies using TheraTogs need to be conducted in future, investigating the basis for the effect of TheraTogs in children with cerebral palsy. The results of the present study showed that the spatio-temporal gait variables of the children with cerebral palsy wearing the TheraTogs were significantly improved compare to those who did not wear the TheraTogs. The results can suggest that the use of TheraTogs in children with cerebral palsy may have positive effect to improve the gait ability. All procedures performed in studies involving human participants were in accordance with the ethical standards of the Kyungnam Institutional Review Board and with the 1964 Helsinki declaration and its later amendments or comparable ethical standards. Rosenbaum P, Paneth N, Leviton A, et al. A report: The definition and classification of cerebral palsy April 2006. Dev Med Child Neurol Suppl. 2007; 109: 8-14. Bleck EE. Cerebral palsy hip deformities: Is there a consensus? II. Botulinum toxin A: A clinical experiment. J Pediatr Orthop. 1994; 14: 281-282. Chrysagis N, Skordilis EK, Stavrou N, et al. The effect of treadmill training on gross motor function and walking speed in ambulatory adolescents with cerebral palsy: A randomized controlled trial. Am J Phys Med Rehabil. 2012; 91: 747-760. Harvey A, Gorter JW. Video gait analysis for ambulatory children with cerebral palsy: Why, when, where and how! Gait Posture. 2011; 33: 501-503. Wilson JM. Developing Ambulation Skills, Oxford London: Black Scientific Publications 1987. Bohannon RW, Walsh S, Joseph MC. Ordinal and timed balance measurements: reliability and validity in patients with stroke. Clin Rehabil. 1993; 7: 9-13. Styer-Acevedo J, Tecklin JS. Physical therapy for the child with cerebral palsy. Pediatr Phys Ther. 1999; 107-162. Amy FB. The effect of suit wear during an intensive therapy program in children with cerebral palsy. Pediatr Phys Ther. 2011; 23: 136-142. Flanagan A, Krzak J, Peer M, et al. Evaluation of short-term intensive orthotic garment use in children who have cerebral palsy. Pediatr Phys Ther. 2009; 21: 201-204. Nicholson JH, Morton RE, Attfield S, Rennie D. Assessment of upper-limb function and movement in children with cerebral palsy wearing lycra garments. Dev Med Child Neurol. 2001; 43: 384-391. Rennie DJ, Attfield SF, Morton RE, et al. An evaluation of lycra garments in the lower limb using 3-D gait analysis and functional assessment (PEDI). Gait Posture. 2000; 12: 1-6. Burman G. Suiting up a look inside the pediatric fitness center and its suit therapy for kids with CP. Cerebral Palsy Magazine. 2006; 6: 28-32. Semenova KA, Antonova LV. The influence of the LK-92" Adeli" treatment loading suit on electro-neuro-myographic characteristics in patients with infantile cerebral paralysis. Zh Nevrol Psikhiatr Im S S Korsakova. 1998; 98: 22-25. Cusick B. TheraTogsTM. The live-in orthotics system you’ve been waiting for. 2007. Richards A, Morcos S, Rethlefsen S, et al. The use of TheraTogs versus twister cables in the treatment of in-toeing during gait in a child with spina bifida. Pediatr Phys Ther. 2012; 24: 321-326. Kim MR, Lee BH, Park DS. Effects of combined Adeli suit and neurodevelopmental treatment in children with spastic cerebral palsy with gross motor function classification system levels I and II. Hong Kong Physiother J. 2016; 34: 10-18. Ko IH, Kim JH, Lee BH. Relationship between lower limb muscle structure and function in cerebral palsy. J Phys Ther Sci. 2014; 21: 63-66. Wood E, Rosenbaum P. The gross motor function classification system for cerebral palsy: a study of reliability and stability over time. Dev Med Child Neurol. 2000; 42: 292-296. Webster KE, Wittwer JE, Feller JA. Validity of the GAITRite®walkway system for the measurement of averaged and individual step parameters of gait. Gait Posture. 2005; 22: 317-321. Van Uden CJ, Besser MP. Test-retest reliability of temporal and spatial gait characteristics measured with an instrumented walkway system (GAITRite®). BMC Musculoskelet Disord. 2004; 5: 13. Elshafey MA. Efficacy of Postural Correction Suit on Gait Parameters and Executive Mobility Activities in Diplegic Children. Int J Physiother Res. 2014; 2: 495-01. Romeo DM, Specchia A, Sini F, et al. Effects of Lycra suits in children with cerebral palsy. Eur J Paediatr Neurol. 2018; 22: 831-836. Mahani MK, Karimloo M, Amirsalari S. Effects of modified Adeli suit therapy on improvement of gross motor function in children with cerebral palsy. Hong Kong J Occup Th. 2011; 21: 9-14. Hemayattalab R, Rostami LR. Effects of frequency of feedback on the learning of motor skill in individuals with cerebral palsy. Res Dev Disabil. 2010; 31: 212-217. Bailes AF, Greve K, Burch CK, et al. The effect of suit wear during an intensive therapy program in children with cerebral palsy. Pediatr Phys Ther. 2011; 23: 136-142. Bar-Haim S, Harries N, Belokopytov M, et al. Comparison of efficacy of Adeli suit and neurodevelopmental treatments in children with cerebral palsy. Dev Med Child Neurol. 2006; 48: 325-330. Maguire C, Sieben JM, Frank M, et al. Hip abductor control in walking following stroke—the immediate effect of canes, taping and TheraTogs on gait. Clin Rehabil. 2010; 24: 37-45. Turner AE. The efficacy of Adeli suit treatment in children with cerebral palsy. Dev Med Child Neurol. 2006; 48: 324-324. Polovina S, ŠkorićPolovina T, Polovina A, et al. Intensive rehabilitation in children with cerebral palsy: our view on the neuronal group selection theory. Coll Antropol. 2010; 34: 981-988.